A classic Cosmopolitan cocktail. Photo courtesy Smirnoff. According to CockailGuru.com, the Cosmopolitan is the second most popular cocktail in America, after the Mojito (and followed by the Mint Julep, Caipirinha, Long Island Iced Tea, Apple Martini, Mimosa, Bellini and Kir Royale). The Top 10 list will vary by source, but there’s no doubt that the “Cosmo” will be a the top. 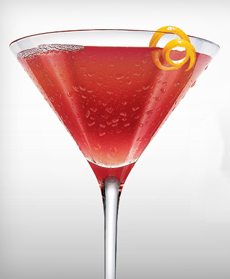 A Cosmopolitan cocktail is a cranberry Martini with added Triple Sec. Cocktail is a stimulating liquor, composed of spirits of any kind, sugar, water, and bitters -- it is vulgarly called bittered sling and is supposed to be an excellent electioneering potion. As to the origin of the word: There are as almost many stories as people seeking them, including stories that far precede 1806. We won’t even try to go into them here, but if you’re curious, just put “cocktail origin” into a search engine window. The Cape Cod, made with vodka and cranberry juice and lime juice or a lime wedge. Given that Martinis sell better these days, the Cape Cod is now called a Cranberry Martini. The Kamikaze: vodka, triple sec and lemon juice. John Caine, Bar Owner, San Francisco. In 1987, Caine served Cosmopolitans in his San Francisco bars. Toby Cecchini, Bartender, The Odeon, New York City. In 1987-1988, a coworker, Melissa Huffsmith, introduced Toby to a variation of Cheryl’s recipe made with regular vodka, Rose’s lime juice and grenadine. He tweaked it into today’s Cosmo, using Absolut Citron vodka, Cointreau, fresh lime juice and cranberry juice—almost the same as Cheryl’s original but with fresh lime juice instead of Rose’s and Cointreau instead of generic triple sec. Most people prefer this “Cosmo 2.0”: The fresh lime juice adds a fresh flavor and a tart note, and Cointreau has a much richer flavor than triple sec. Cosmo Tip: If you’re ordering a Cosmo at a bar or restaurant, ask if fresh-squeezed lime juice or Rose’s lime juice is used. If it’s the latter, order something else. In a Cosmo, the fresh lime juice makes a big difference. Rose’s is lime juice concentrate sweetened with high fructose corn syrup. When it was patented in 1867, sugar was used as a preservative, so that lime juice could be preserved without the addition of alcohol. In the U.S., the sugar has long been replaced with HFCS. The ingredients include water, high fructose corn syrup, concentrated lime juice, sodium metabisulphite (a preservative) and Blue 1 (an artificial food color). In the U.K. and Canada, sugar is still used (HFCS is not popular with the regulators). Unlike many of today’s Cosmo recipes, Toby Cecchini’s recipe is more tart than sweet. The sweetness of the Cointreau is balanced by the acidity of the lime and cranberry juices. Lower-end bars still use Rose’s lime juice instead of taking the time to muddle a fresh lime. *Toby’s original garnish was a coin-size orange slice, flamed. 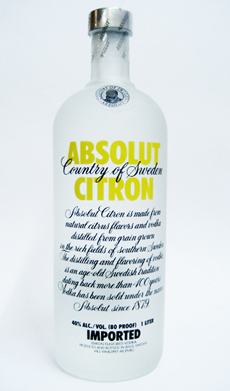 Absolut Citron inspired the creation of the Cosmopolitan Photo courtesy Absolut. Chill the Martini glass in the freezer. Add the vodka, Cointreau, cranberry juice and lime juice. Strain into Martini glass. Garnish with a slice of lemon or orange peels.